Having trouble finding the right magazine stands to match your collateral and literature display needs? The variety of designs and styles available can be daunting when making a choice. A wooden floor standing magazine rack with convertible acrylic pockets serves a completely different purpose from a lightweight, folding aluminum display designed for trade show collateral. Similarly, a rotating wire spinner for retail use is at the other end of the spectrum from a freestanding information kiosk for take-away literature. Floor standing magazine stands, sometimes called collateral display stands, need to accommodate anything from promotional brochures to print catalogs to waiting room reading material. In addition, many professional and commercial businesses also require frames for displaying marketing posters or advertisements. Our huge inventory of fixtures is separated by material for the easiest possible selection process, with additional filter parameters for fine-tuning. What additional features can a floor standing magazine rack have? Pocket size: Magazine stands are actually designed to hold a variety of literature sizes, ranging from traditional 8" x 10" periodicals to standard 4" x 9" trifold brochures and beyond. Acrylic pockets frequently come with dividers that allow them to accommodate a variety of reading material. Multi-purpose design: Standalone collateral display stands, particularly those designed for use in commercial or professional environments, are often used to showcase materials from integrated marketing campaigns. Poster-size branded advertisements, when used in conjunction with coordinating take-away literature, are a proven method of attracting, educating and converting potential customers. Portability: Standalone magazine display stands are a superior choice for use at trade shows and other offsite events. Lightweight folding pop-up holders take seconds to set up, keep reading material or takeaways organized and tidy, and break down easily for transportation and storage. The majority of our portable fixtures for trade show use even include their own carrying case for convenience. Visibility: Magazine racks designed primarily for retail use need to allow easy access to contents in any environment. Freestanding stands run the gamut of styles from durable wood holders to rotating wire spinner-style towers. Businesses in most industries will use magazine racks in an office or retail space. For many commercial or professional locations these simple literature holders are indispensable accessories, in fact. Hospitals, dentist or doctors' offices, schools, hotels and restaurants and other service businesses with waiting areas or lobbies frequently offer reading materials to their clientele. Advertisements, marketing materials, product catalogs and service brochures can take up valuable counter space and create clutter. Freestanding or tower-style stands help keep health and retail offices organized and tidy while giving customers full visibility. 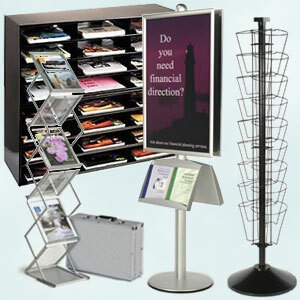 A standing magazine rack with built-in poster display frames can help attract customers to take-away collateral pieces. What kinds of standalone magazine racks are available here? Wooden stands have a traditional look that lends a classic feel to any environment. A wide variety of finish colors allows these freestanding fixtures to be matched to any décor. Economical plastics are ideal for creating modern-looking, stylish stands that are both sturdy and lightweight. Molded acrylic literature pockets can be easily configured to accommodate any contents while offering maximum visibility. Metal racks run the gamut from standalone aluminum framing to lightweight, portable folding fixtures and affordable wire containers. As sturdy as wood with the modern feel of acrylic, these holders are ideal for use in any situation and frequently incorporate usability features such as wheels for mobility. Retailers and trade show/event exhibitors alike appreciate the ease and affordability of heavy-duty corrugated literature racks. Easy to assemble and strong enough to withstand heavy traffic use, these standalone fixtures are ideal alternatives to heavier, more permanent towers or holders. Shopping for professional office stands, like a wave literature rack, can be fun when there are so many styles to choose from. Think about how these fixtures will be used. From folding display racks for trade shows to rotating towers for gift or convenience stores, there's a reason this line of business supplies is so popular. These floor standing fixtures come in every finish, style, and configuration. Catalog-sized publications with corresponding pockets for trifold pamphlets will fit in some of these cheap brochure holders, providing the user with tons of publication storage and display options. Organize supplies using the stands for sale at this reputable website. An elegant mahogany magazine rack looks great in an attorney’s office, while modern organizers with acrylic pockets and chrome wire finish are the perfect accessory for spa or dentist waiting rooms. The literature display stands featured here come in so many styles, there's no need to go to another online store! Cheap magazine holders are not all alike, so take some time to browse the many options.